Britain's best-selling sci-fi monthly comic gets a massive revamp on July 4th! The award-winning anthology is being relaunched as Volume 4, issue one. The mighty monthly is more than doubling in size, with 100 pages of cover to cover thrills! It will feature high quality cover stock and prestige format perfect binding - all for just 3.95! There will be more pages of all-new action starring future lawman Judge Dredd, by writer John Wagner and artist Cam Kennedy! Pulp noir anti-hero Lenny Zero returns and theres an all-new, all action eight-page colour strip by hot UK comics talents! That is just for starters! The Megazine will also showcase classic tales from the 2000 AD archives, re-presented here in all their glory! The first issue stars D.R. & Quinch by Alan Moore and Alan Davis, plus Ro-Busters by Pat Mills and Dave Gibbons. But there's more! The Megazine is launching a new slot called Beyond 2000 AD, featured top creator-owned strips by top British talents. The first character to assume the position is cyberpunk legend Lazarus Churchyard, courtesy of acclaimed creators Warren Ellis and DIsraeli! Future strips include the original ABC Warriors and the most requested story in Megazine history, Button Man II by John Wagner and Arthur Ranson. 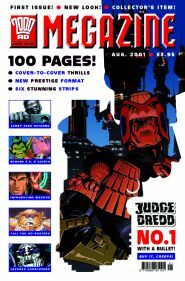 The revamped Megazine makes it debut with Volume 4 #01 on July 4th, 2001 - it would be a crime to miss it, creeps!